All of the blues and greens I have been working with lately have made me crave pink and red. I haven't started making anything for my baby, so I decided to finally work on some quilts. I don't find out the gender of my babies, so I prepare by making two quilts. A lot of these fabrics were pulled from my overflowing scrap bins. I aimed to choose pink fabrics that had at least one other color in them. To be honest, I had intended to do a baby girl quilt that was much more dramatic with a more vibrant and saturated color scheme. But it was that darn gorgeous Pretty Potent voile that changed my plans. If I do have another girl, I probably will just make an additional quilt more true to my original vision. I've tried to go the extra mile for my nephew that's due in about 2 months. I have five siblings and only two of us are married - I need my brothers and sisters to start having children so that I can continue to make cute baby things. It's so fun and I love doing it. This week, I returned to an old favorite pattern: the "brainy ball." This thing looks hard to do but it's more time consuming than difficult. My recent experience in hand quilting encouraged me to try popping the knots through the fabric and it worked! It worked much better than trying to start the hand sewing in the middle of the ball and trying to come up to the corners for the hand sewing that joins the wedges. The sail boat baby quilt is also completed. I am really happy with it. I am so late to the party on doing an all HST's quilt! I ordered this Passport sailboat fabric from Etsy and was sweating it all week, waiting for it to arrive. The seller sent it very promptly, it just seems like things come slower than they did in MA. Anyway, I finally gave up on waiting for it and visited a LQS to see if they'd have anything comparable I could use. The first bolt of fabric I saw was the exact one I had ordered online! 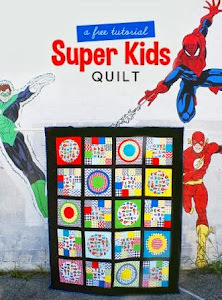 I couldn't believe it because I don't have much luck in finding exactly what I want at brick and mortar stores that cater to traditional quilters! It's such a perfect fabric for backing a quilt, it's very large scale. I am not sure what I am going to do with the extra piece I had ordered. Today was a Front Range Modern Quilt Guild meeting and I was finally able to give the elephant Swoon mini quilt to another member, Noreen. During show and tell, she shared a mini swoon quilt top she had made- so that made me happy, knowing she likes that design. This is the mini quilt I received from Cornelia. I really do have a thing for whales and thought a Narwhal would be a fun twist. She really put a lot of effort into this! The quilting is really dense and well done. She also shared with me that a few of the fabrics are from Senegal- which is definitely special to me considering my love for Africa and African fabrics. I hope I am safe posting this before my SIL receives all the baby shower gifts I have been working on. Sometimes I feel like I really do not have a clue who reads this blog. Anyway, I have made some bibs to match the nautical theme and here's the quilt top. I originally thought that I might do the Crazy Mom Quilts no-triangle chevron pattern, but I worried that the blue fabrics might not provide enough contrast for the pattern. Since the parents are into sailing- I finally decided I would do simple half square triangles since they look like little "sails" without being too literal. I used this free template to create 3" finished HST's without trimming (8 blocks each time!). This came together really fast. Now I am just waiting for the perfect backing fabric, it was sent yesterday and I am really hoping that I can get it all in the mail no later than Saturday. My sister-in-law is expecting a baby boy just two weeks before me. The baby shower is at the end of February. I wish I could be there but I am happy to make some baby items to send. She let me know that "sailing/nautical" is the nursery theme and she likes blues and greens. Yesterday afternoon, I whipped up these bibs and today I will continue to work on the quilt. 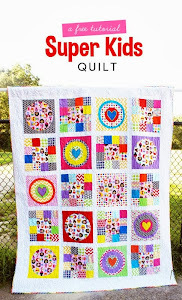 Linking up to Le Challenge for their most recent theme, "Dots." Happy Friday everyone! I stayed up a bit late last night to finish this quilt top, effectively decimating my black fabric stash. But it's good: that's what it's for, right? Honestly, I enjoyed making these Swoon blocks A LOT. I would've made more if I had had more typewriter fabric. That fabric was hard to find when it first came out, so I would pretty much have to sell my unborn child for more of it at this point. I opted for big borders instead of more blocks, aiming for queen size at 90 x 108. The decision to go scrappy was made just before I started sewing. I wouldn't have had enough of one print to do otherwise anyhow. Here's a close up of that last block that needed a bit more fabric to be completed. As soon as it arrived in the mail, I got to work. This picture also shows a fun, quirky print I won in a giveaway from Australia. Sad to see it all gone now but it's so fun and I am glad I used it. The drawback to making such a big quilt is getting it quilted. I am not sure if my longarm free motion skills are good enough and I am not sure if a computerized pantograph would really work for this. I will think on it for a while. Here's another finish, a quilted pillow made with a 2.5" charm pack of Anna Maria Horner fabrics that was a freebie with a previous fabric order. This pillow came together with a solid blue FQ from my stash, a scrap of binding from my Dreamweaver quilt, and a Dowry print I had. I sent it to a friend whom I love- she's always been so appreciative of things I've made and she's been on my mind. Thanks for reading, linking up to Finish it up Friday. Inside the bag was a mug rug made with AMH Loulouthi fabrics. The quilting is really impressive. See that orange grid on the blue dotted fabric? That is all quilted in orange thread! So pretty. The bag was chock full of other treats and goodies. The whale softie kit was a generous extra received on Sunday. These are the items I gave to my secret sister, Beccy. The bottom left item is a Noodlehead Road Trip Case, blogged here. The choice of the red bike fabric for the open wide zip pouch was a happy accident: she loves biking but I had no idea! I just chose that fabric because she said she liked the color red and that fabric had a little pink in it, which matched one of the only 14" zippers I had on hand. Here's a picture of the "swag" the retreat organizers got for us from some generous sponsors. I am especially thrilled with the fabric, I already own most of it but I am more than happy to have more. Finally, here is a picture of my current WIP that I started sewing in the last few hours of the retreat. I have a nephew's baby shower deadline coming up, so the pressure is on! I am back from the FRMQG retreat now. It was a wonderful weekend that could not have been better. It was so refreshing to sew constantly without interruption. I enjoy my children and was glad to see them when I returned, but I didn't exactly "miss" them, if you know what I mean. In fact- this return to routine today has been a bit of a rude awakening. Gregory woke up at 5:00 and seemed quite sick. I cuddled with him on the couch until Charlotte woke up and she was even more sick than him! I have been kind of a fog all day because I am so tired. Anyway, I mostly worked on my Swoon quilt and I made a ton of progress. I had everything pre-cut and lines were drawn on anything that needed that guide. I had a mini iron and ironing pad on my table and I just sewed constantly all weekend. I wasn't able to complete this block because the fabric I bought on the IG de-stash didn't arrive before the retreat. I just love that AMH Loulouthi print and I only had a fat quarter. It really makes me question buying FQ bundles; all too frequently, it's not enough. I am amazed at the demand for F8 bundles, to me, those are scraps! Here's the large pile of half square triangles I sewed together that were leftovers from the Swoon blocks. It will probably be ages before I do anything with them but the fabrics are too good to throw away. Overall it was a great retreat with good company. It was this time last year that I barely had moved to Colorado from Massachusetts and I attended the same retreat. I am glad to have that year behind me, moving so far is no joke! I am amazed at how much has changed in a year: I am six months pregnant, my husband started a new position today (a well deserved and overdue promotion), and I am in the throes of dealing with the mixed blessing/headache of "school choice" and kindergarten registration for my oldest. When I was at the retreat last year, I was kind of in a state of shock and fatigue. Now, a year later, I am so glad to be feeling better and more sure of myself, so hopefully that will continue. On my next blog post, I will share the fruits of my participation in the "Secret Sister" swap at the retreat.